Earlier in the week Susan and I planned to bike the Silver Comet Trail (SCT) on Sunday, April 2nd. We always start at the 0 mile point on Mavell Road. Parking has not been a problem for our past rides which were during the week. This was our first trip to the SCT for 2011 and our first time on a weekend. The 100 parking spaces in the main lot were full when we arrived at 12:30PM. So, we parked in the last of 70 spaces available in the second parking lot at Nickajack Elementary School on Mavell Road. The first Nickajack parking lot on the north side of the school, is further from the trail, and has bus spaces that should accommodate an additional 70 vehicles. The trail starts just a few hundred yards away from the school. If you haven't been on the trail before you'll be happy to know, when you visit, there are several facilities with parking lots and restrooms. Smaller rest areas with benches are located more frequently. This was our first ride on the new pedestrian bridge over Old Lost Mountain Road. If you've ever ridden on the trail you'll remember Old Lost Mountain Road as the big intersection that actually seemed to leave the trail. It's located at about the 10 mile point. The trail changes from asphalt to the less desirable concrete at mile 13. You can really tell the difference. Our trip passed a waste treatment facility at mile 16 which was memorable. It's even more so during the summer months. Somewhere after mile 17 is the memorial to Jennifer Ewing who was killed while cycling on the trail in 2006. At the 20 mile point we stopped at the Old Villa Rica Road facilities. This was our turn-around. It's a nice rest area with restrooms and a water fountain. You'll note that I said the rest area was nice, and not the rest rooms. I believe they saw a good bit of use over the weekend and you could tell. The SCT was packed with people and some of their four legged friends. 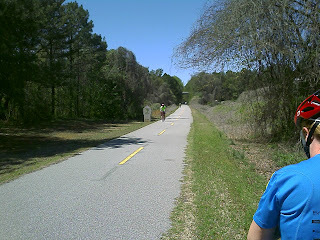 There were all manner of human powered wheeled conveyance (except unicycles) on the trail. Triathletes on their areobars, group riders on road bikes, mountain bikes, families with little ones on (and off bikes) with (and without) training wheels, kids and dogs in trailers. There were the runners and walkers too. As always, the trail was clean. Even the pollen wasn't bad. We noticed some construction on the sides of the trail but the path itself was not affected. The temperature was 74 degrees when we arrived. It warmed up to 80 degrees by the time we finished. Unfortunately, I took a number of pictures of the trail with my cellphone camera but only three were in focus. After our ride we drove into Atlanta and had a late lunch at Houston's. Our day was capped off with a viewing of the 2011 Tour of Flanders bicycle race in Belgium. I recorded the tour earlier in the day. The next facility west of Mavell Road has parking space for 36 cars and restrooms. 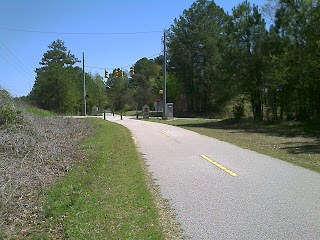 It's located on Concord Road at the 2.5 mile point. West of that is the Floyd Road parking area at the 4 mile point which has about 200 spaces. This is where the bike shop is located. The Carter Road facility has parking space for 26 cars but no restrooms. It's located at about the 8.5 mile point. The Florence Road facility has parking for about 90 cars and restrooms. It's located at the 10.5 mile point. There is additional parking in a gravel lot across the road. The parking area on Seaboard Road is at the 14.5 mile point. It has about 30 parking spaces but no restrooms. The depot diagonally across the street is a popular starting point for many riders and has about 60 additional spaces. I don't know if it has any restrooms. For even more information about the Silver Comet Trail go to the Path Foundation and Silver Comet GA websites. All these years and I've never ridden the Silver Comet. Thanks for the great details on parking. I finally read my cellphone camera user's guide so I should have more pix in the future, but no guarantees.